fosera, a manufacturer of solar powered off-grid lighting products and appliances, has emerged winner in the inaugural Outstanding Off-Grid Appliance Awards competition run by the Global Lighting and Energy Access Partnership, (Global LEAP). The competition sought to identify and promote the world’s best, most energy-efficient off-grid color televisions and LED room lighting appliances. fosera, which works closely with the Lighting Africa program to bring to market high quality, affordable solar lighting products for families with no access to grid electricity, was announced winner in the “Emerging Technology – Small” category for its solar-powered 12V television set. “We’re super excited about this award! Our next step is definitely to get the TV on the market within the next 2 months,” says Catherine Adelmann, fosera’s General Manager. 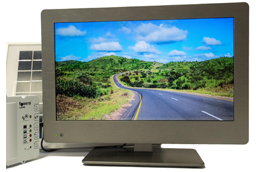 fosera was one of five winners in the Outstanding Off-Grid Televisions category. Another three winners were named in the Outstanding Off-Grid LED Room Lighting Appliance category, in which another company working with Lighting Africa, Niwa Solar, made finalist for its Home 300 Lamp. fosera prides itself in bringing to market high quality, long lasting, modular lighting products such as the Scandle 200 and the Pico Solar Home System 7000, both of which meet the Quality Standards for off-grid lighting products. The company started commercial production of the Pico Solar Home System in 2011. It has its main factory in Bangkok, Thailand and several local assembly lines in India, Mozambique, Kenya and Ethiopia. The local assembly lines are designed according to Triple Bottom Line Principles to positively impact on the environment, society and economy. The local assembly line has created jobs and is contributing to the development renewable energy in the country.